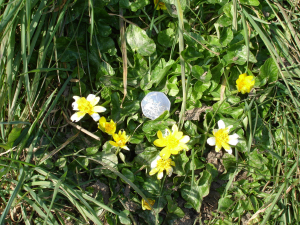 Observation - Lesser celandine + 50p - UK and Ireland. Description: Looks very much like Lesser celandine except for some white patches on some petal tips. Is this age or the cold? - there is still a lot of snow around. Looks very much like Lesser celandine except for some white patches on some petal tips. Is this age or the cold? - there is still a lot of snow around.